The holidays are the time of year where we look back at the year behind us, reminiscing about the great memories we've shared with our friends and family. It's a time in which we get together with our loved ones over delicious meals to give thanks of all we've been blessed with. 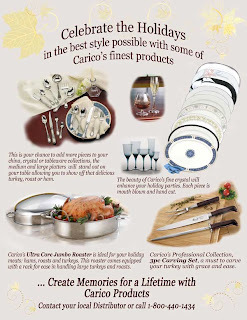 Carico would like to be a part of your holiday celebrations this year and every year. Celebrate the holidays in the best way possible with some of Carico's finest products. Here's a great turkey recipe with some cooking tips on how to make the perfect turkey in your Carico Ultra Jumbo Roaster. We hope you enjoy! Chop garlic finely in processor. Add butter and next 6 ingredients, then remaining porcini. Blend to coarse paste. DO AHEAD: Can be made 2 days ahead. Transfer to bowl. Cover and chill mushroom butter, reserved chopped porcini, and mushroom liquid separately. TRUE GRIT: When using the porcini soaking liquid, pour it off slowly so that any grit or sediment at the bottom remains in the bowl. *Dried porcini are at supermarkets, specialty foods stores, and Italian markets. Place turkey on rack set in your Ultra Large Carico Roasting pan. Rub outside of turkey all over with oil; sprinkle with salt and pepper. Pour 2 cups stock into pan. Roast turkey until thermometer inserted into thickest part of thigh registers 165°F to 170°F, about 3 hours. Tilt turkey so juices from main cavity run into pan. Transfer turkey to platter. Tent very loosely with foil; let rest at least 30 minutes (internal temperature will rise 5 to 10 degrees). Reserve pan. Heat reserved 3 tablespoons fat in a large skillet over medium-high heat. Add crimini mushrooms, garlic, and shallot. Sauté until mushrooms are tender, about 6 minutes. Transfer mushrooms to bowl and set aside. Add wine to skillet. Boil until reduced to 1/2 cup, about 3 minutes. Add reserved 1/3 cup chopped porcini mushrooms, reserved mushroom soaking liquid (leaving any sediment behind), 2 cups stock, and degreased pan juices. Bring to boil. Reduce heat to medium-low and simmer to reduce slightly, about 10 minutes.